= Takusan tabeta kara nemuku natte kita. = I ate a lot so I am getting sleepy. We learned present tense and future tense last week with Tofu Sensei. 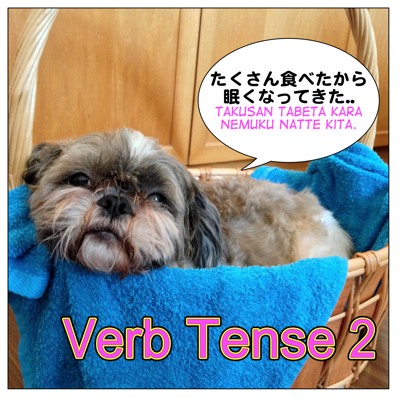 Today Frisky Sensei will teach you how to use the past tense and present perfect tense in Japanese. Frisky sensei looks so sleepy. I wonder if she is ready to teach…. = Wake up! Frisky sensei! Whoooaaaaa… who woke me up? 誰が起こしたの？= Dare ga okoshita no? Ah, OK, it’s time to work. Let’s continue what Tofu-Sensei taught last week. 3) 朝ご飯を食べた。 = Asagohan wo tabeta. (polite form) 朝ご飯を食べました = Asagohan wo tabemashita. I ate breakfast. / I have eaten breakfast (I’ve finished eating breakfast). 4) 朝ご飯を食べていた = Asagohan wo tabete ita. (polite form) 朝ご飯を食べていました = Asagohan wo tabete imashita. I was eating breakfast. / I had been eating breakfast. / I used to eat breakfast. 1) Describe what you did/ what happened at a specific time. = Kinou, hyakupeiji mo yonda/ yomimashita. = I read 100 pages yesterday. = Amazon de chuumon shita hon ga kyou todoita/ todokimashita. = The book I ordered online arrived today. = Kyou no yoji ni hikouki de narita ni tsuita/ tsukimashita. = We landed in Narita Airport at 4:00 today. = When did you come to Japan? = Kyonen no sangatsu ni Kyouto ni itta / ikimashita. = I went to Kyoto last March. = Maggie no shashin wo Feisubukku ni sakuya, appu shita/ shimashita. = I posted Maggie’s picture on Facebook last night. = Hachiji niwa mou ie ni kaette ita/ imashita. = I was already home at 8:00. = Mada kono kanji wa naratte inai/ imasen. = I haven’t studied this kanji yet. = Kare wa mou kaetta yo / kaerimashita yo. = He has already left. / He is gone already. = Frisky wa atarashii ressun wo tsukutta/ tsukurimashita. = Frisky made a new lesson. / Nemo have made a new lesson. = Kyonen no imagoro, furansugo wo benkyou shiteita/ shiteimashita. = This time last year I was studying French. = Kinou, denwa wo kaketa toki, nani wo yatte itano/ yatte imashita ka? = What were you doing when I called you? = Shawaa ni haitte ita yo./ imashitayo. = I was taking a shower. = Senshuu wa sakura no hanaga kirei ni saite ita/ saite imashita. = Last week cherry blossoms were blooming beautifully last week. = Kinou, sono mise wo tootta toki, takusan no hito ga gyouretsu ni narande matte ita/ imashita. = When I passed by the store yesterday, many people were standing in line. = Mou shukudai owatta/ owarimashita ka? ＝ Un, mou owatta. / Hai, mou owarimashita. = Dono gurai, matta / machimashita ka? = How long have you been waiting? = Sanjuppun gurai, matta/ machimashita. = I have been waiting about 30 minutes. or I waited about 30 minutes. 2) When you talk about someone’s experiences in the past. = Nihon ni sankai itta/ kimashita. = I have been to Japan three times. = Nattou wa nankai mo tabetayo/ tabemashita yo. = I have eaten / ate Natto many times. = Nihon ni itta koto ga aru / arimasuka? = Have you ever been to Japan? = No, I haven’t been there. = Nattou wo tabeta koto ga aru/ arimasu ka? = Have you ever tried natto? = Ikkai dake sono mise ni itta koto ga aru yo./itta koto ga arimasu yo. = I have been to the place just once. = Kono sofuto wa yoku tsukatte ita/ tsukatteimashita. = I used to use this software a lot. = Mae wa jitensha de kaisha ni itte ita/ itte imashita. = I used to go to the office by bike. You use ~ていた ( = teita) + ものだ ( = monoda) / ものです ( = monodesu) when you recall your past experiences like you tell a story. = Mukashi wa kono kouen de yoku yakyuu wo shiteita monoda/monodesu. = I used to play baseball in this park a long time ago. = Kodomo no koro wa tezukuri no omocha de asonde ita monoda/monodesu. = When we were children, we used to play with handmade toys. = Kyou, kanojo ni au tsumori datta ga dotakyan sareta./ au tsumori deshitaga dotakyan saremashita. = I was going to see her today, but she cancelled at the last minute. = Sensei ni shukudai wo miseru tsumori dattaga yameta./ miseru tsumori deshitaga yamemashita. = I was going to show my homework to the teacher, but I didn’t. = Yatto ressun ga owariashita. Mou nete ii? = I finally finished the lesson. Can I sleep now? マギー先生より = Maggie Sensei yori = From Maggie Sensei. Could you help me this point ! Is a) is possible if I want to focus on the action (wake) I did in yesterday. And if I use 作っていた, I am focusing on the already-completed product. But is that correct sensei? Thanks Maggie sensei as always ! 起きた means “got up” and it’s a one-time action. ５年間”で”作った作品　the piece/pieces of artwork that I made/finished making in these five years. ５年間作っていた作品 the piece/pieces of artwork that I have been making for five years. Oh my God, it’s clear now. I had a quarrel with friend about the two sentences and would like to share it with you. Oh no, you had a fight with your friend? Then don’t tell me who said what. (1) 私は結婚している = talking about the current state. I am married. If you say 私は結婚していた。then it means this person got divorced or husband/wife passed away. Hope you make up with your friend. Don’t worry sensei! Making quarrel with friend is normal. Thanks for another great lesson, Maggie sensei. I have a problem with verb tense that I hope you will help me with: In the lightnovels I’ve been reading the narrators’s sentences often switch between past tense and present tense. Is there a clear rule for this? I think it is the same in English. When you tell a story, you sometimes use present tense so that the readers can feel it is happening now. Thanks for your hard work making this lesson. I have a question about past continuous tense and present continuous tense. Would you mind answering me. Thank for your clear explanation . I know the new thing. Then, my confusion is if I want to focus on describing the state that my wallet has been dropped (from yesterday until the time I talk about the state), which one should I use? Since ているalso can describe the state resulting from an action, they lead to my confusion. And if I want to focus on the state that I wear glasses (from ten years ago, until the time I talk about it), which one should I use? Then, could you please explain more why we should use it. Many thanks for the lesson, Maggie sensei. Love you! OK, the two of your example verbs are not actual “action” so it won’t apply the rule. 落ちる is intransitive verb (to fall) and 落とす is transitive verb (to drop something) which is considered to be an action. As I said “some action”/ “after the action” in 2), 落ちている is not actually an action. めがねをかける is one time action, to put on glasses. Thanks for your patience answering my question! I also feel difficulty to decide past continuous or present continuous for some specific verbs like　知る、似る。Whether 知っていた and 似ていた are used? The state of A is same as B regardless of present or past. OK, let me give you a quick answer for now. I feel the sky is becoming clear now. Again, thanks a lot and have a nice weekend. You’re very welcome, Bella. You have a nice weekend, too! Yes, I found four comments in the SPAM file. If one comment doen’t go through, it is probably because it goes to the SPAM file. Don’t worry. I always check SPAM file. 作っていく = to make something and go somewhere with what you made. 作ってくる= to make something and come to where the speaker was/is with what they made. 1) I taught Japanese on Maggie Sensei’s site for seven years. 2) I have taught Japanese on Maggie Sensei’s site for seven years. Could you explain the difference between お金を持ってない and お金を持たなかった, and which is more commonly used. Are the translated as “I haven’t brought money” or “I don’t have money now” and “I didn’t bring money”? Thanks in advance! I will watch TV after studying. /After I finish studying, I will watch TV. わあああ〜　今回はFrisky ですね！！　嬉しかったです！　フィーチャをありがとうございました！ Thank you also for all the lessons. They are, without fail, so interesting and helpful. Thank YOU for introducing us Frisky Sensei, Jane! Frisky Sensei is a really sweet teacher. Though she was REALLY sleepy, she worked hard so hard for us. Please give a big hug to Frisky-sensei! Thanks so much. I have seen adverbs such as 今日、最近 etc, also followed by は. Does this work the same as above, showing a contrast? 最近は作曲をしたりしてるんだ。And if the particle は is dropped in the above. Is there any difference? Does the particle は here also indicate a contrast, Sensei? I have seen adverbs such as 今日、最近 etc, also followed by は. Does this work the same as above, showing a contrast? And yes, you could drop は if you don’t show the contrast or emphasize the time related words. Thank you so much Maggie Sensei! Hello sensei. Why don’t these sentences use the particle を? Why not say このソフトを… and 日本語を…? So は has a function to show contrast and you can use it as an object marker. I will show you other example.